Cambo Ultima 4x5 inch large format camera from Calumet. What is the best 4x5 camera for large format digital photography? At Photokina 2001 we selected the Sinar X and Arca-Swiss 4x5 cameras as the best. Since Arca-Swiss was in the middle of moving its office from Switzerland to France (to gain entry to the Common Market), no Arca-Swiss was available to test. But Sinar Bron kindly made a Sinar X available to evaluate. The Sinar X is an impressive piece of precision machinery. Thus I felt that Calumet was very brave when they suggested that I test their Cambo Ultima against the Sinar X. Since the test would be using a Better Light scan back I first asked Michael Collette whether I would be satisfied with the Cambo Ultima after become accustomed to the Sinar X. Collette indicated that the Cambo was an excellent camera and that I would be pleasantly surprised. I then checked out the Cambo at the Calumet booth at PMA (Photo Marketing Association, the largest photography trade show in America). A week later a brand new Cambo arrived at the main office of FLAAR. In St. Louis. Since we do most of our testing of camera equipment at our studios in Guatemala, the full test will continue with our upcoming season. In the meantime, we inspected the basic camera. Here is the Cambo at PMA trade show. I had also seen it earlier at Graph Expo and at Seybold '99 (San Francisco). Calumet is the exclusive distributor of Better Light and the Cambo is their flagship 4x5 studio camera. Based on the previous two years of testing the prototype Better Light scan back with various 4x5 cameras, I would not advise trying to use a cheap 4x5 camera. That is not the place to safe money. You need a solid camera to hold the weight of the scan back without sagging (the Linhof Technikardan sagged the most; the Sinar X sagged a little, but it was an older demo and possibly loose from all the years at trade shows and all over the country as a demo unit. Perhaps a new Sinar Xwould not sag as much. The Wisner portable technical 4x5 camera sagged the least. It was rock solid. But you absolutely need micrometer movements. Sliding movements (movements that slide along an open groove) are the worst kind if you need to do product photography (close-up and macro photography). When we unpacked the Cambo it made a good impression from the very beginning. If you wish additional information on the equipment described on this page, you might wish to contact: service@calumetphoto.com., tel 1-800-CALUMET. 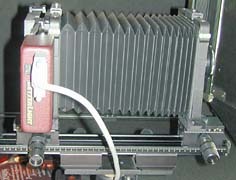 Calumet sends Cambo Ultima 4x5 camera to the FLAAR Photo Archive for evaluation. Last udated Aug. 5, 2001.